The great hammerhead (Sphyrna mokarran) is the largest species of hammerhead shark, family Sphyrnidae, attaining a maximum length of 6.1 m (20 ft). It is found in tropical and warm temperate waters worldwide, inhabiting coastal areas and the continental shelf. The great hammerhead can be distinguished from other hammerheads by the shape of its “hammer” (called the “cephalofoil”), which is wide with an almost straight front margin, and by its tall, sickle-shaped first dorsal fin. A solitary, strong-swimming apex predator, the great hammerhead feeds on a wide variety of prey ranging from crustaceans and cephalopods, to bony fishes, to smaller sharks. Observations of this species in the wild suggest that the cephalofoil functions to immobilize stingrays, a favored prey. This species has a viviparous mode of reproduction, bearing litters of up to 55 pups every two years. Although potentially dangerous, the great hammerhead rarely attacks humans. It sometimes behaves inquisitively toward divers and should be treated with respect. This shark is heavily fished for its large fins, which are extremely valuable on the Asian market as the main ingredient of shark fin soup. As a result, great hammerhead populations are declining substantially worldwide, and it has been assessed as Endangered by the International Union for Conservation of Nature (IUCN). Great hammerhead sharks, Sphyrna mokarran (Rüppell, 1837), can easily be confused with the smooth hammerhead, Sphyrna zygaena (Linnaeus, 1758), because of their similar size. The great hammerhead, however, is the largest of the 9 species of hammerhead sharks and is reported to reach up to 6.1 m in length and weigh up to at least 581 kg. 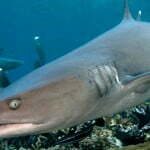 These sharks have a flat hammer-shaped head with a notch at the center located along the front edge. Juveniles have slightly curved heads at the front margin that becomes nearly straight as they reach adulthood. This species can be identified by its nearly rectangular head. The first dorsal fin is very high and curved; the second dorsal and pelvic fins are high with deeply concave rear margins. They are light gray or gray-brown on the dorsal side, white on the ventral side and fins lack conspicuous markings. Their “hammer-shaped” head is thought to have evolved to maximize the area of sensory organs such as the Ampullae of Lorenzini (special sensors in sharks’ skin used to detect chemical, physical and thermal changes as well as the electrical fields of prey species, including those buried in the ocean bottom—certain fishes, rays, crustaceans, etc.). Their hammer shape also allows hammerheads to scan significantly larger areas of the bottom when hunting than other shark species. Great hammerheads are coastal-pelagic, semi-oceanic sharks, found close inshore and well offshore, over the continental shelves, island terraces, and in passes and lagoons. They occur widely throughout the world’s oceans in depths ranging from 1-300 m.
Great hammerhead sharks prefer to feed on stingrays and other batoids, groupers, and sea catfishes; they also prey on other small bony fishes, crabs, squid, other sharks, rays, and lobsters. They are known to be cannibalistic but the reasons remain unclear. Stingrays seem to be a particular favorite and stingray barbs have been found in the jaws and head of great hammerheads. They reportedly kill stingrays using the “hammer” to pin them down while feeding on the ray’s wings. 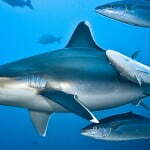 Great hammerheads are a viviparous species producing 13-56 pups per litter that measure between 56-70 cm. Viviparity means that the eggs hatch inside the female’s body and the babies are fed by a placenta which transfers nourishment from the mother via an umbilical cord connected to the pup between the pectoral fins. The placenta transfers nutrients and oxygen from the mother’s bloodstream and transfers waste products from the baby to the mother for elimination. 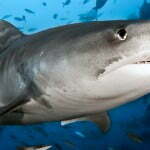 Viviparous sharks give birth to live young. Hammerhead shark eggs are fertilized inside the female’s body. 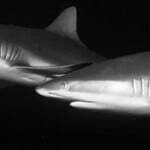 Like other shark species, males have claspers, or extensions of the pelvic fins, that are used to transfer sperm to the female through her cloaca to fertilize the eggs. Check the Conservation Status of Great Hammerhead Sharks Note: if there are no entries found, it only means that this species has not yet been evaluated. 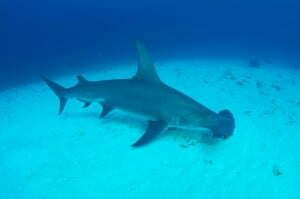 Great hammerheads are potentially dangerous, though only a few shark attacks can be attributed to the great hammerhead because of the apparent difficulty of distinguishing the large hammerhead species involved in attacks. Although they are not targeted directly by commercial fisheries, hammerheads are a bycatch species of tropical longline and drift net fisheries with highly valued fins. Great hammerhead meat is sold for human consumption (fresh, fresh-frozen, dried-salted, and smoked), their liver oil for vitamins, fins for soup, hides for leather, and carcasses for fishmeal.